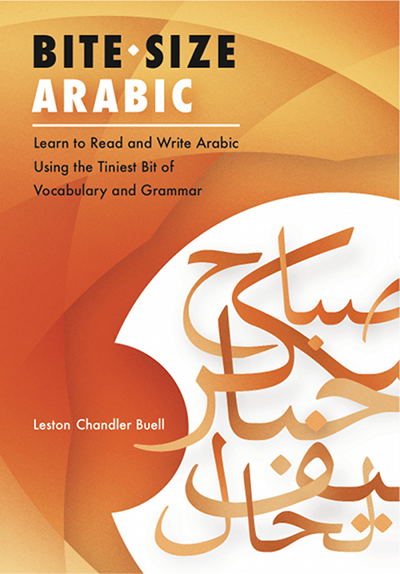 Bite-Size Arabic: Learn to Read and Write Arabic Using the Tiniest Bit of Vocabulary and Grammar by Leston Chandler Buell (that is, by me, Dr. Bulbul) is a new textbook designed for both classroom use and independent learners. The book’s companion website has a (hidden) page for teachers where you can also download sample pages. In this article, I will describe how I use this book in my introductory, ten-week courses for adults at UvA Talen in Amsterdam. Brief description of the book. Bite-Size Arabic teaches the Arabic writing system, along with about 135 vocabulary items and a bit of grammar. Letters and diacritics are introduced a few at a time over the course of twelve units. The numerals are also introduced in the last unit. The vocabulary and grammar is closely linked to the letters that the student has learned to read: Words are only introduced at the point where the student can read them in Arabic script. Furthermore, letters are presented in such an order that basic words such as the singular pronouns, the demonstratives, and the definite article can be introduced early on, allowing students to read complete simple sentences as early as the second unit. The focus throughout the book is on working with complete sentences. There is a companion website with audio of the vocabulary lists and most of the exercises. A companion handwriting workbook with exercises closely tied to the book can be downloaded for free. Session 1: Bite-Size, Unit 1. Tasharrafnaa, Unit 1, texts. Session 2: Bite-Size, Units 2 and 3. Tasharrafnaa, Unit 1, exercises. Session 3: Bite-Size, Units 4 and 5. Tasharrafnaa, Unit 2, texts. Session 4: Bite-Size, Unit 6. Tasharrafnaa, Unit 2, exercises. Session 5: Bite-Size, Unit 7 and 8. Tasharrafnaa, Unit 3, texts. Session 6: Bite-Size, Unit 9. Tasharrafnaa, Unit 3, exercises. Session 7: Bite-Size, Unit 10. Tasharrafnaa, Unit 4, texts. Session 8: Bite-Size, Unit 11.Tasharrafnaa, Unit 4, texts. Supplementary materials in Arabic script. Session 9: Bite-Size, Unit 12. Supplementary materials in Arabic script. Session 10: Review. Final exam. Short reading exercises. Many of the exercises, especially those designed to practice a new letter, have the student read individual words. I usually do these together with students, calling on individual students to read the words, going in a circle. This gives me the opportunity to correct pronunciation and answer questions about Arabic script, to everyone’s benefit. Other exercises I do this way include letter descrimination exercises (e.g., does this word contain a ث or a ش?). Translation exercises. For translation exercises, I have the students divide up into pairs. Besides keeping the class more lively, this ensures that every student actually works through each sentence. It is also great to see how students coach and teach each other when they work in pairs. Dialogues. A couple of the lessons have dialogues, such as the four dialogues in exercise 11-H (Unit 11). The first step of working through such a dialogue is the same as a translation exercise: figuring out what is written and what it means. I have the students break up into pairs for this. Then, when all of the pairs have finished, for each dialogue I pick two students to read the two parts. Homework regime. My general approach is to have the students read each Bite-Size unit before it is discussed in class. The only exception is the very first session, in which I explain the entire first unit in class. Then they don’t actually have to read Unit 1, except for the section about typing Arabic on a touchscreen device. Once a unit has been discussed in class, they complete any exercises in the unit that we didn’t do in class, and they also complete the corresponding unit in the handwriting workbook as homework. Completing the corresponding Unit 6 in the handwriting workbook. Because both Bite-Size and the handwriting workbook have answer keys, the students can check their own work. However, it’s a good idea to check their handwriting homework from time to time so that bad habits can be corrected. Note that some students prefer to work on the exercises before a unit is discussed in class, using the companion website for help with the pronunciation. At this level, students are not expected to know how to spell words of Arabic from memory. However, they are expected to know how to write the pronominal suffixes. So, if I give them the word بيت, I can ask them how to say “his house” and they are expected to write بيته. They are also expected to know how to conjugate a verb correctly (singular persons, present tense) if they are given one form. (7) make a possessive of a given noun (e.g., بيت, “his house”). أهلاً وسهلًا! اسمي مريم وأنا من هولندا. In preparation for learning to write this, when we are approaching the end of the textbook, we devote time in class to discussing how foreign names are spelled and make decisions concerning how each student wants to spell their name. I like giving this memorized text because it gives the students something they can do to impress their friends and demonstrate that they can do something concrete after finishing the course. Conclusion. I hope this article has given you some ideas on how to use Bite-Size Arabic in the classroom. I have had very good results with this book, and students who have gone on to higher levels have told me how much they enjoyed using it. If you have more ideas about how to use Bite-Size in the classroom, please share them with us by leaving a comment. Next I want to learn Arabic. How should I start?